The Isles of Shoals, nine rocky isles six miles off the New Hampshire and Maine coast, were announced to the Western world in 1614 by Capt. John Smith, of Pocahontas fame. 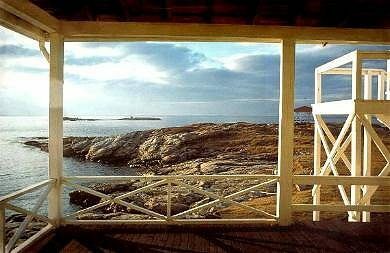 Over the years since they served as a base for fishermen working the bountiful waters of the Gulf of Maine, a haven for the occasional pirate, a summer retreat for artists and the well-to-do, and for more than 100 years, the site of a Unitarian conference center. No one lives year-round at the Shoals any more — there’s White Island Light, the Oceanic Hotel where the Unitarian conferences are held, a few summer houses, and the Shoals Marine Research Laboratory — but the Shoals are often visible from the beaches from Newburyport, Mass., to Ogunquit, Maine, and they figure prominently in the Seacoast imagination. A famed double-murder took place on Smuttynose Island in the 1800s (the basis for the book and movie “The Weight of Water”), and New Hampshire’s most famous poet of the 19th century, Celia Thaxter, was raised there, the daughter of lighthouse keeper Thomas Laighton. Various excursion boat companies cruise to the Shoals, usually accompanied by descriptions of the area’s colorful history. Since the Shoals are privately owned, stopovers are not always included in cruises or are limited.